In an effort to beautify the multitude of cold construction sites in and around Lower Manhattan, the Downtown Alliance has announced three new art pieces as part of their Re:Construction initiative. Re:Construction is a local construction site beautification project spearheaded by the Downtown Alliance. 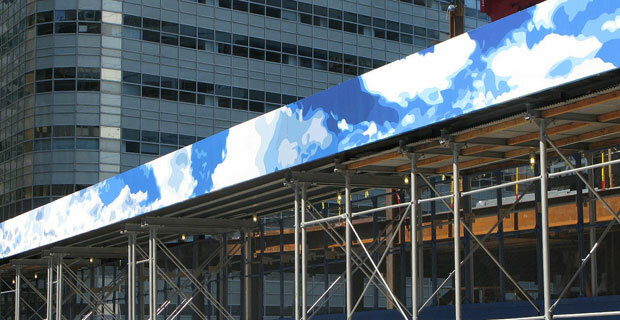 “Now Lower Manhattans workers, residents and six million annual visitors can enjoy Richard Pasquarelli as part of our program to recast construction sites as canvases for innovative public art and architecture,” says Elizabeth H. Berger, President of the Downtown Alliance. Re:Construction is a public art program which is funded by the Lower Manhattan Development Corporation. The program has produced 16 pieces since 2007, seven of which are currently up for viewing. The three pieces unveiled this week, will be placed at three construction sites south of Chambers Street. The first piece “Restore the View” can be seen at the site of CUNY’s Fitterman Hall, a building which was destroyed on 9/11 at Barclay Street. The two other works are: “Secret Gardens” will be installed at the Chambers Street road construction project which spans from West Street to West Broadway, and “Hours of the Day” which is set to be installed at Washington and Albany Streets. Once construction is completed at these areas, the pieces will come down. Richard Pasquarelli is a 41-year-old Bronxville born artist whose paintings have been seen nationwide, including at the National September 11 Memorial Museum.